Once upon a time, John Sayles would release a movie — Matewan, Eight Men Out, City of Hope, Passion Fish, Lone Star — and both the cultural tastemakers and people who heed them engaged with it. They marveled at the vastness and authenticity of the casts (the Joe Mortons, David Strathairns, Chris Coopers, Mary McDonnells, and Elizabeth Peñas of the world). They praised the righteous wisdom of the storytelling — his films lean left and aim for our higher, better selves. They’d exalt Sayles as the apotheosis of American independent filmmaking. But nothing lasts forever. Sayles seemed to release a movie about every 18 months. Setting aside his lucrative work as a script doctor (Apollo 13, Mimic, and The Mummy are just three), he never directed for Hollywood, and I think with some of those tastemakers Sayles fell out of fashion. Their eyes were on men like Wes Anderson and Paul Thomas Anderson. The stridency, strain, and mystical symbolism of his recent films made it easier to move on (Casa De Los Babys, Silver City, Honeydripper). His last film, Amigo, was an intimately scaled but ambitious reconsideration of the Philippine-American War, and it was barely distributed. I don’t know what Sayles would have to do to regain the art-house primacy he’s lost. Getting a good film released clearly isn’t enough: Go for Sisters is his 17th film and his strongest in almost a decade. You probably have five minutes until this movie disappears from theaters, but if you need convincing, that’s fine. An uptight Los Angeles corrections officer (Lisa Gay Hamilton) discovers that her estranged son is mixed up in Mexican shadiness. She doesn’t know that world, and she asks for the help of an old friend, a junkie ex-con (Yolanda Ross) who might have violated her parole. These two wind up alongside Freddy Suarez (Edward James Olmos), a retired detective with a besmirched reputation and the right wrong connection. What could have been a south-of-the-border thriller becomes a riskier, more daring emotional drama. The search for the son turns out to be an excuse for these two very different women to heal their friendship (that title refers to how, as girls, people would say they could be sisters). But the shabby apartments, seedy bars, and long car rides — to say nothing of the spontaneous gunfights, the occasional air of menace, and that two-bad-chicks-in-danger plot — bears traces of blaxploitation. Ross’s character is named Fontayne, and she knows how to throw people around. The surprise is how unafraid Sayles is of the genre, how he has located the truth in it. He has simply removed all the posing and camp and jive and gone directly for the emotion at the core of most of those films. That’s where the heat is for him. He’s gotten the richest film performance Olmos has been asked to give in a long time. There’s comedy in most of his exasperated delivery. You can feel wisdom and see sadness. His long face rhymes with Ross’s. She’d be the Pam Grier of the operation, but she puts melancholy where the badassery and bodaciousness would be. It’s a deceptively layered performance, one you’d find only in a Sayles movie. No one else would dare build a movie around Ross, Olmos, and the dependably strong Hamilton, not even on television. This isn’t a great movie — some of it is sloppily assembled — but Sayles’s easy confidence here is a pleasure. He’s completely at home with the poor, the brown, with women. He has none of the pity or guilt or piety in which a different white writer or filmmaker might get trapped, none of the over-identification and false empathy, either. He’s not speaking for anyone here. The characters speak for themselves, and they say a lot. This disturbingly pleasant Nazi-era drama begins in 1938 Germany. 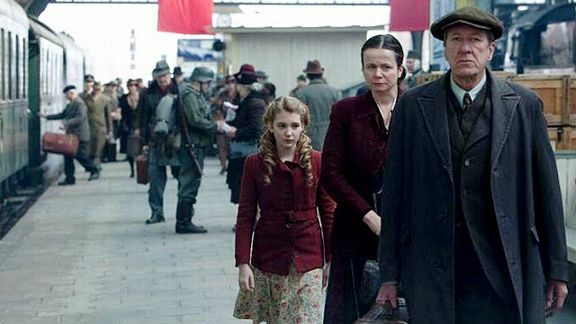 Little blonde Liesel Meminger (Sophie Nélisse) goes to live with the Hubermanns (Geoffrey Rush and Emily Watson), a poor, childless couple in Berlin. Hitler’s government deemed Liesel’s mother a Communist and has almost surely killed her. Liesel’s younger brother died in transit. The children in her new school mock her illiteracy, but she manages to pound away at one of her tormentors. Herr Hubermann teaches her to read, and soon she’s availing herself of a wealthy woman’s personal library. There’s more. Liesel’s neighbor and classmate Rudy (Nico Liersch) becomes so obsessed with Jesse Owens that he paints his face brown and reenacts Owens’s victories alone on a track. Nazi banners hang everywhere. A stranger turns up at the family’s doorstep, a musician and motherless Jew named Max (Ben Schnetzer), whom the family hides away and to whom Liesel becomes attached. And the entire affair is narrated from Death’s point of view. Are parents taking children to see this movie? Based on Markus Zusak’s novel, it has been made to resemble a fable. But even a very young person will sense that something foul is afoot — the interiors have a dire drabness, and when no one can hear them Liesel and Rudy are given to shouting “I hate the Fuhrer!” But an adult might sense, in the focus of non-Jewish woe, a more wishful sort of purification. The years pass, the war arrives, and Liesel’s neighborhood is publicly rid of its Jewish residents. But they don’t turn up among the images of the dead, as if the filmmakers have had enough with the depictions of that sort of misery. The film lingers over the fear of males being conscripted into military service and argues that the Holocaust stole from gentiles as well. As fine as Rush and Watson are, there’s just no emotional centerpiece. So the incidents pile up in a way that appeals to your moral senses. But the movie lacks the nerve to treat death as anything more menacing than the tooth fairy. Sometimes all you want from a movie is more. Sorrentino’s opulent carnival of modern Rome is the most more you could ever hope to see. It gets up close to an aged aristocrat (the fantastically soulful Toni Cervillo) and casts a satirical eye upon the tackiness and grotesquerie of his world. What results is a parade of luxurious and occasionally hilarious set pieces — in palaces, bedrooms, gardens, and parties. 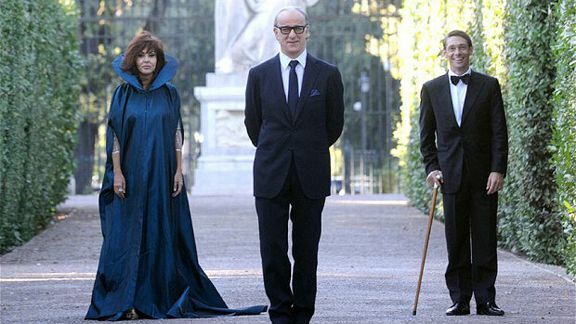 Sorrentino communes with Federico Fellini’s La Dolce Vita, but his ambition trumps Fellini’s sense of cultural and moral demise — if only because Sorrentino has cultivated more outrageous symbols of ruin. I adore this movie. I saw it first back in May, and wrote about it in detail, and it has stayed with me so vividly all these months, the way a tattoo would. But Sorrentino isn’t satisfied with a stamp on your arm. He leaves you covered in ink.